Now most people know Betty Crocker is quite famous for her cookies and baked goods. 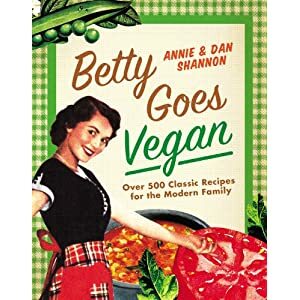 So you can imagine (or look up in your copy of Beg Red ) that there are more than a few cookie recipes we are going to need to bake through to complete our vegan journey. That brings us to an inspired idea we had to bake a million cookies (not literally) which in our home is actually considered being productive and hang out with some of our nearest and dearests. We would host a Cookie Party! I'm not going to bore you with the details of how we invited over some of the most talented vegans we knew, asked them to bring enough cookies for everyone to have 2 (because unlike those insane cookie swaps where everyone leaves with dozens and dozens of cookies - we're just eating) and then we got together to eat them. I mean unlike many things in life - Cookie Parties are pretty much what they claim to be : 2 of the best things on the planet combined. 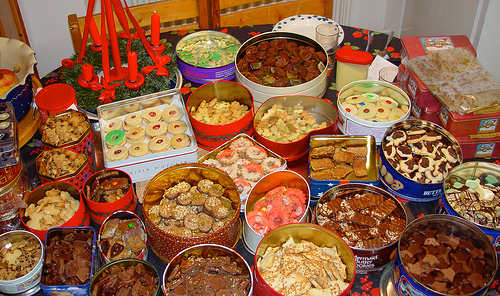 We had a pretty impressive spread/tsunami of cookies and tea. You can check it out for yourself if you don't believe me. In a large bowl, mix Margarine, Powdered Sugar, Vanilla and Candy Canes with an electric hand mixer until blender. Then blend in Walnuts, Flours and Salt. You're going to get a crumbly dough. Roll the dough into balls there are about 1 Tablespoon. Place them on a ungreased cookie sheet about 1 inch apart. Now Betty says bake them for 10 minutes. These cookies were ready for us in around 5. So I would keep an eye on them starting at 5 minutes. Check the bottom to see if they are ready. Remove them from the oven when the bottoms are golden brown. Place on a wire rack to cool. Put between 1 - 2 1/2 cups of Powdered Sugar in a shallow bowl. When the cookies are still warm but not so soft they dent when you touch them - roll them in the Powdered Sugar. 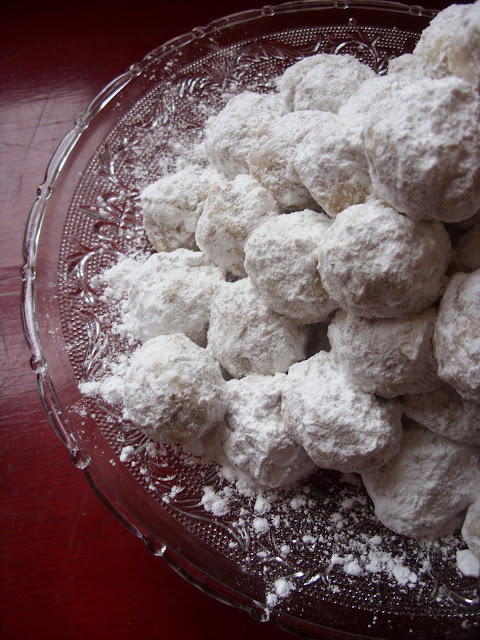 Right before you serve them - roll them in the Powdered Sugar again and sprinkle a little bit over the top. In a mixing bowl, mix Brown Sugar, Shortening, Margarine, Almond Extract and Applesauce with an electric mixer. Once it is smooth, blend in Flour and Salt. You're going to have little pebbly crumbles. Put your Walnuts in a small bowl. Shape the Dough into balls about the size of a melon ball. VERY GENTLY roll the Dough Balls in the Walnuts. You want to get a nice light coating of the dust at least some chips. Place them on an ungreased cookie sheet about 1 inch apart. Gently push your thumb in the center to make a little cup for your jam. Don't push so hard you go through the dough. You want a shallow bowl. After you're done with rolling and pressing your cookies - you can go through and gently put more Walnuts on your cookies. Just gently take the bigger pieces and push them into the edges. Betty says bake each cookie sheet for around 10 minutes. Again mine were done at 5 minutes. So you'll want to start checking on them around 5 minutes. Once the cookies are a nice golden brown remove them from the oven and take a soup spoon and gently press any cookies that have lost their Jam cup. Let them cool on a wire rack and then fill with 1 - 1/2 teaspoon of Raspberry Jam. cutest kid ever, if you ask me!